Last Software Update: 11th February 2019. "New Unique Software Application Submits Your Book Promotion To Over 32 Sites In 15 Seconds - WITHOUT Filling In Mindless Forms OR Outsourcing To Fiverr! "KDROI is a game changer..."
KDROI is the tool I’ve been waiting for. Leave it to Wes Atkins, the forward thinker who developed KDSpy, to come up with this incredible way to save time and money when submitting your Kindle book’s free days to promotional sites. In minutes after getting access to the program, I had it loaded and had submitted one of my books free promotional days to 22 sites. Minutes instead of what in the past would have taken hours! And, in the past, when I haven’t had the time to submit Kindle free days myself, I have paid (virtual assistant, Fiverr, etc.) to have the book submitted … KDROI will easily justify its price in a minimal number of submissions for book promotions that I would have paid for in the past. One of the best features of KDROI is that is comes from the force behind KDSpy. 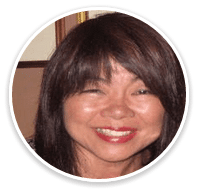 Based on my experience with KDSpy, the support is unparalleled: questions and concerns are addressed immediately, updates are frequent and free, and there is a hands-on understanding of self-publishers. Now that I have this fantastic tool, I am going to use it to schedule my next round of Kindle KDP free promotional days … and, do it quickly and efficiently. KDROI is a game changer. 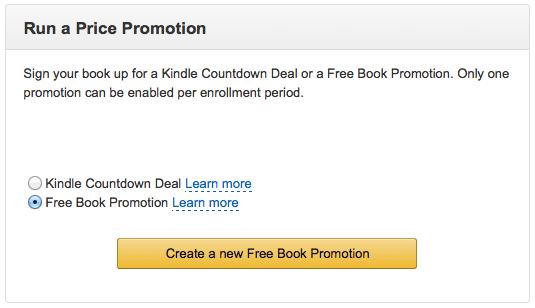 Before using KDROI, just setup a Free book promotion or Kindle Countdown deal (OR just manually set your book price to 99c) for your Kindle eBook in your Amazon KDP account. Then revert back to your bookshelf and click on your books 'direct' Amazon link to view your book on the Kindle store. 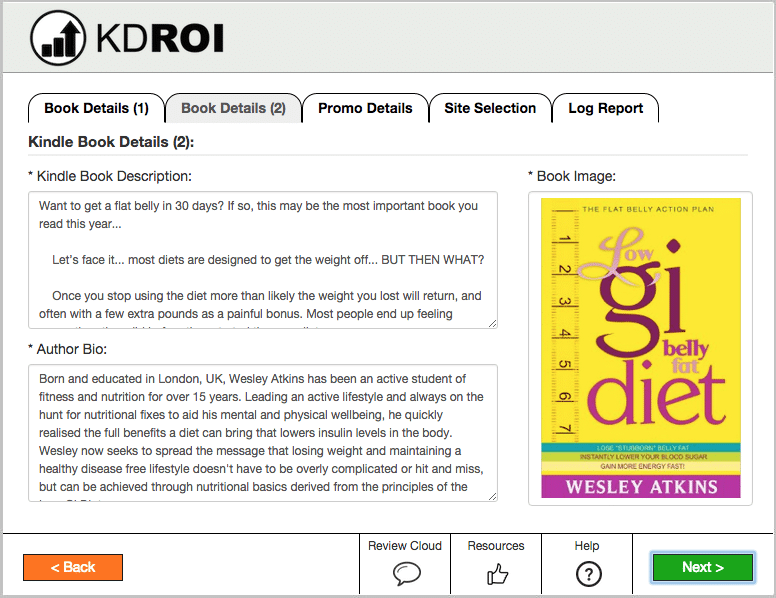 Once you're viewing your book on the Kindle store, KDROI will work on the background to grab all the essential information from your book listing page. A single click into KDROI on your browser and the only 2 things you need to do are, select whether you book is fiction OR non-fiction, then enter your email address. 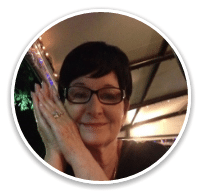 After clicking next you will be presented with your book description, your author BIO and you cover image pulled from Amazon. If you want to make any changes to these details, you can amend them in the boxes provided. You can even upload a NEW image for your cover if you wish. Once you are happy with the details, click NEXT. On this screen you will be presented with a very simple calendar which corresponds to the dates of your promotion for your Kindle ebook. 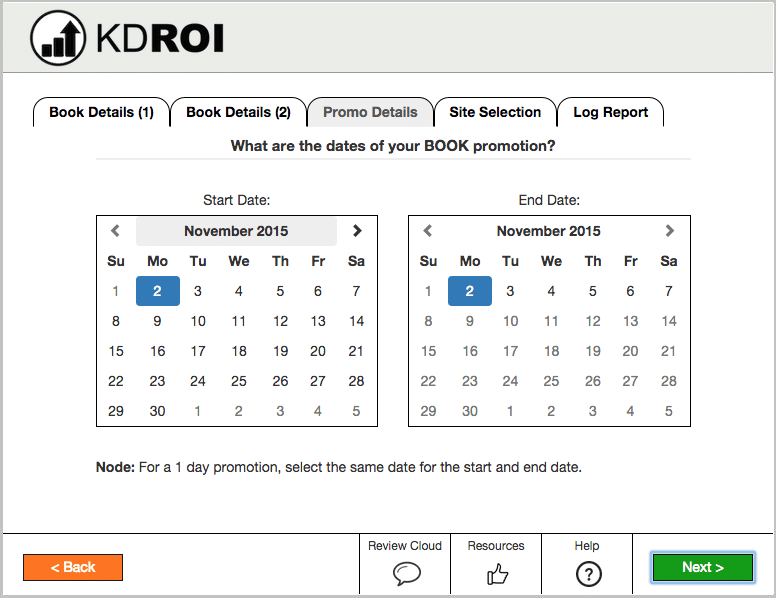 Just select the START and END data of your book promotion and click NEXT. You will then be presented with an 'ever-growing' list of sites that will list your Kindle eBook on their website during your book promotion. Simply select the type of promo (FREE, 0.99c or Permafree) ... and the sites you want to submit to. Then, click 'submit promotion', and in less than 15 seconds, you're finished. KDROI integrates directly into your browser. That means you submit your book from your Kindle eBook page, not with some lame software buried on your computer. Who remember’s to use those? Not me. 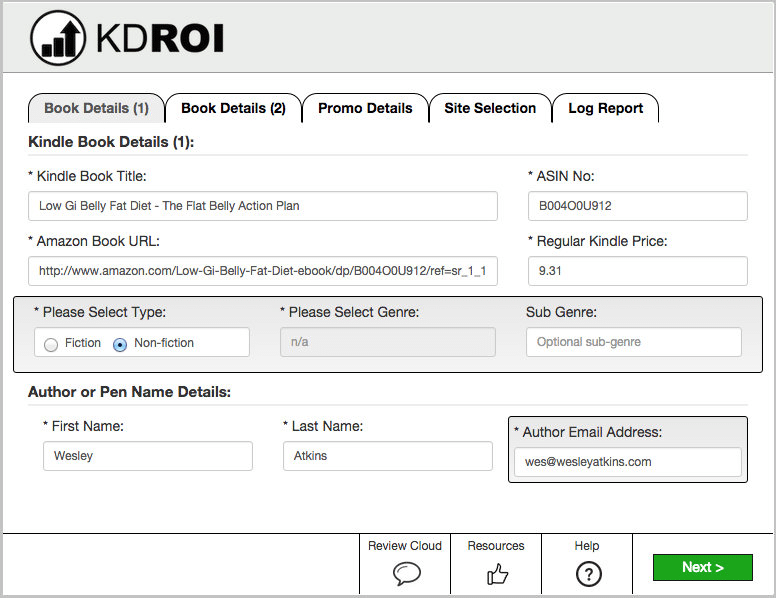 KDROI was painstakingly coded from the ground up to be the quickest Kindle submission tool on the market. Forget manual forms, KDROI does 99% of it for you. Saving you time and outsourcing dollars. KDROI installation is so simple a child could do it. In fact, it takes just one click and you’re done. I’m serious. And because it installs into the browser, it’s uses very little system resources or disk space. Hi Wesley, I must say that KDROI must be the best product I have bought for a long time. It was so easy to use, I thought I must be doing it wrong. But, no, my book was submitted quickly and easily to all but 1 of the free sites. I'm also impressed with the instructional videos and free cheat sheets and ebook you provided. All in all, great product and great service! 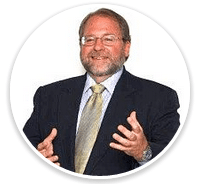 Your purchase is 100% RISK–FREE! 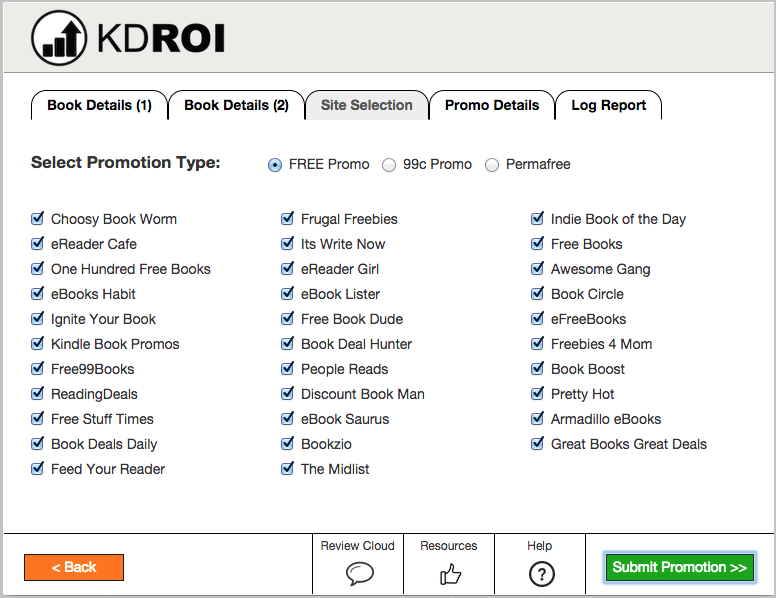 We're so confident that KDROI will save you time and money on paying freelancers for book promotions that we offer a full 60-Day – no hoops to jump through – Money Back Guarantee. Try it for yourself, and if you don't see the tremendous value it gives you in the first 60 days, simply let us know and we'll refund your money — no questions asked. * FREE Lifetime Updates. 60-Day Satisfaction Guarantee. Yes! This is a one-time payment of JUST $47! Does KDROI work on Mac and PC? Yes. KDROI is a Chrome Browser extension that is compatible with both PC & Mac. And the good news is, installation takes less than 4 seconds no matter what computer you’re using – seriously! Can I tell if my book was accepted? Yes. Absolutely. After your promotion has been submitted, we'll give you the log results of the submission. We'll even show you the sites that accepted and rejected your book submission, if any. 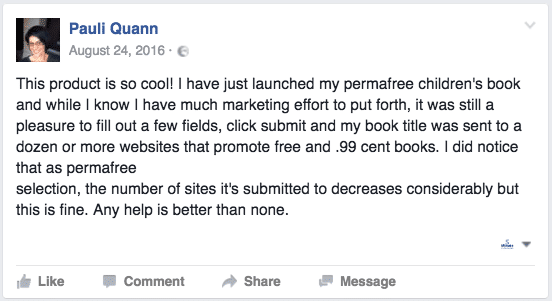 Do this work with Permafree books? Yes. KDROI supports a bunch of sites that accept submissions for Permafree books. As with the constant updates since release, there will be more sites added to this feature shortly. Do I get future updates to KDROI? Yes. If you lock yourself in today for the insane price of $47 – that’s all you will ever pay. You will get ALL future updates to the software for life. And I plan on making a lot of updates based on user feedback. Heck, we made 15 killer improvements on our LAST software release; KDSPY. Yes. The submission database contain a diverse range of FREE listing sites. You can submit fiction or non-fiction books for acceptance. Note: we currently have 32 sites you can submit to, but this will increase overtime as the software updates are released. KDROI is programmed to work on Google Chrome and Mozilla Firefox only. Due to the declining popularity of other browsers it will unlikely be supported on any others in the future. 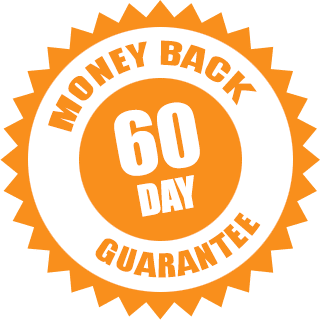 You are protected by our 60-Day 'No Questions' Asked – Money-Back Guarantee!